Shellice wanted to lose weight before her wedding so she could look her best on her wedding day. 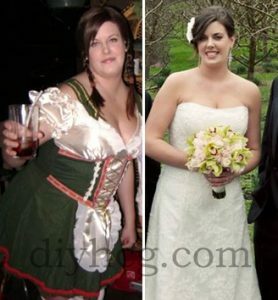 She lost a total of 40 pounds in 2 rounds on the DIY HCG Diet before her wedding. As you can see from the pictures, Shellice had body reshaping in her neck, arms, waist, and hips. What a beautiful bride?! Good job Shellice, we are happy that we were able to make your 'big day' better with a smaller size wedding dress. “There is only one word for HCG, AWESOME! I haven’t felt this good about myself in what seems like forever. It is so great to get those looks (you know what I mean) from guys and compliments from everybody you know and see. When someone asks me how I did it, and I can tell they are truly interested, you can’t shut me up about HCG. I’ve referred a lot of people to your HCG website. I’ve told them they have to follow the HCG regimen exactly if they want results, and they can’t cheat if they truly want results. I tell them to read your HCG book, do research, read the manuscript to see if HCG is right for them. It’s not that complicated once you understand the dos and don’ts. I have lost weight in the past; most recent was about 9 years ago, 60 lbs. Which, I naturally had put back on about 40+ lbs. But it took a year to lose those 60 lbs. Until I heard about HCG, I just could not get motivated, to try to lose again, because it seems to take forever to make progress. My HCG goal was to lose 30 lbs. and if I could do that, I might consider going another 10 lbs. Well, I lost 30 lbs. in 45 days, and was so ecstatic about it, I lost a total of 43 lbs. overall with one round of HCG. I don’t recall losing inches in the past, like I did with HCG. I was a size 12 jeans/pants, and am now a 6 and have even bought a size 4. I did a lot of research on HCG, because that is just the way I am. As with anything if I’m going to do it, I’m going to do it right, and DIYHCG was right for me. The more I researched HCG, the more it motivated me. I couldn’t wait to get started. HCG is definitely a most worthwhile investment.” ~Marilyn S.
“I'm on my 3rd round of the diet, I've currently lost 68 pounds and gone from a size 22 to a size 12... never been a 12 in my adult life, so I'm very happy to have been recommended this HCG Diet. 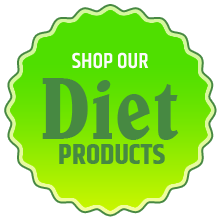 This is the first and only diet that has ever worked for me.” ~Skye A.